Latest Lahore Ring Road Master Plan Map. Northern Loop is assigned gray Color, Southern Loop is assigned Red Color, where as Northern Loop Interchange is assigned Red color with black ring and Southern Loop interchange assigned Gray color with black ring. All proposed / future interchange are assigned respective color but with dotted line black ring. As you can see a dotted line black ring with gray back ground between Bahria Town and NFC II, it mean there is an interchange proposed for future but not the part of the current ring road. All dotted line rings are proposed interchange for future but not the part of current plan. Salam, Is there any news and chances of improvement for Statelife Phase 2? I have a 1 kanal plot there for 10 years and prices have not gone up. People still say its a good long term investment because of the ring road getting completed the prices will increase a lot. is it true? Definite Ring Road will have impact on prices of all surroundings soceities / areas but if we are expecting too much increase in this slow market situation then I dont think so. salam, Is there any news and chances of improvement for Lake Cit M2-A? I have a 10 Marla plot there for one years and prices have not gone up. People still say its a good long term investment because of the ring road getting completed the prices will increase a lot. is it true? Not dealing with Lake City at the moment, not updated, please contact a local area agent in Lake City for further assistance. i WANT TO KNOW ABOUT BAGH-E-IRM( OFFICERS & EXECTIVES COOPERATIVE SOCIETY) NEAR HALOKI, IS I BUY A PLOT FOR HOUSE CONSTRUCTION?? IS THIS SCHEME OK???? Bagh-e-Iram is LDA Approved society, please verify the plot status and documents from Bagh-e-Iram Society Office before making any buying decision. Tanks very much Atif Sb. Kindly guide me is it suitable for house construction as they do not give possesion but dealer said that possesion will be grant in march. I am not well about this society. But it is LDA Approved Society. However you need to check status of society with LDA Lahore. Can you tell me about Green belt around the ring road Lhr. Which green belt you are talking about? Dear i listion govt going to run train inside ring road quaid e azam interchange to mehmood booti interchange and govt will take more place in side ring road for green belt.is it possible? Lahore Ring Road Southern Loop 1 and Southern Loop 2 images were given by a valued visitor of our site. I will request him to provide a larger image, if provided I will upload here. I have a plot in Bahria town Rafi Block. Can you please confirm if it’s in the plan of ring road. You need to contact Bahria Town directly they have the best information about it. I also have a plot in Khayaban e Amin and facing the same problem. Agents have been informed that your plot will be effected by LRR. If you have any further news so please share. Can someone please advise regards below Khayaban e Amin questions? hi m block khayaban e amin, will any residential plots will be effected by Lahore ring road? there are rumours that whole block will be needed by LRR and all owners of m blocks will be effected? can you please advise? After Ring Rd, it will be a valuable Land.So, have some patience. Hope fully work started at full swing in August 2106. All work is completed and budget sanctioned. We are not dealing with this area and are not updated. You are requested to contact any local area agent for further assistance. Are you talking about Punjab University Town Phase 3? Yes Lahore Ring Road development will affect the prices in Halloki Garden. I have no idea about prices there please contact any local area agent in the area. Would you please state the affect of LRR on Lake city? Positive or negative ? will canal garden (near bahria town) effect from ring road ? Will Tulip Extention Block C , Bahria Town be effected in Ring Road? I have booked 5 marla plot in lake city will that be beneficial for me ? sir can u please be guide if i may get a plot in CITY GARDEN , project of PCHS, near LDA city, 5 mirla of Rs:10 lac including development charges on installments. what would be the future of this housing scheme ??? as i m low paid government servant , also this society is faraway from Lahore city at about 40 km from Lahore chuburji . I just purchased a plot at babu sabu near ravi located end corner. Will this plod be effected by ring road? We have no idea about it. Please contact LRR Authority for further assistance. Is Khayaban e amen Included in SL2 ?? Sir I plot in bahria town lahore, sector e, johar block . Now it’s market value is about 70 lack. Should I hold my plot till the complete of ring road. The ring road route will benefit my plot site and price or no effect . Thanks for your nice advice. At the moment only SL 1 and SL 2 will be developed. SL 3 will not be constructed at this time. SL 3 sill benefit Bahria Town. I better recommend you to sell this plot and invest in DHA Lahore. In first Phase SL 1 from Sui Gas to Gaju Matta will be completed, this benefit DHA Phase 9 Prism and prices will shoot. Lahore—FWO has been awarded the contract of construction of (southern loop) of Lahore Ring Road. Commissioner Lahore Division and Chairperson Lahore Ring Road Authority, Abdullah Khan Sumbal has said that Punjab Chief Minister Muhammad Shehbaz Sharif has directed FWO to complete southern loop of Lahore Ring Road within one year. Due to special interest of Punjab Chief Minister, Punjab government has succeeded in saving 1.70 billion rupees in this contract, he added. He said that under public private partnership, Punjab government has played its role in viability gap financing in the construction of 30-kg long southern loop convinced FWO to complete construction work in 4.25 billion rupees instead of 5.90 billion rupees. 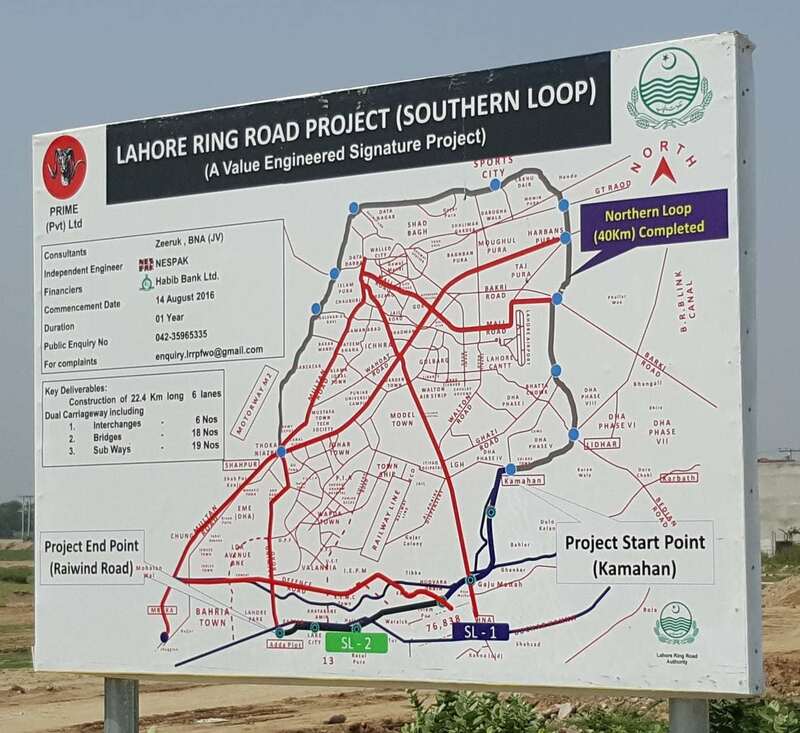 Abdullah Khan Sumbal told that southern loop of Lahore Ring Road consists of three sub-loops including southern-I, II and III. FWO will first start work on I and II loops which is 22 kilometer long, he added. He said that this agreement has been given to FWO on the basis of BOT (build, operate and transfer) under public private partnership. He said that Punjab Chief Minister Shehbaz Sharif has especially directed to complete southern loop of Lahore Ring Road within the stipulated period and ensure high standard. It is worth mention that Punjab government has made savings of 215 billion rupees in different mega projects and saving of 1.7 billion rupees in Ring Road Project is part of campaign of Chief Minister. according to my informations, southern loop from sui gas society to multan road will be completed at a strech..
My plot is located in L block of Khyaban e amin near L block park. Will it be affected by ring road.Plz guide. I am not much aware about Khayaban e Amin. I have no idea which block will come in Ring Road or not. Please contact any local area agent or Khayaban e Amin directly for further assistance. No news about the start of Ring Road after the last date for Bids (Expression of Interest). Can anyone tell whats happening about the Ring Road Southern Loop? Lahore Ring Road Southern Loop 1 and 2 contract has been awarded to Federal Work Organization (FWO). Cheif Minister directed to compete the Ring Road Loop 1 & 2 within one year. Dear Atif Sb, My plot is located in NFC2 A block,which block of NFC2 is effected by LRR. Additionally please confirm if plot gets effected, what options do we have in terms of compensation. Will we be paid by Government or NFC will provide us alternate plot? Please confirm. If possible please share current map of LRR passing through NFC 2. Is there any change in ring road loop 3 in bahria town? Although there are strong news in market for change of SL3. But only LRR Authority can confirm it. We do not have any confirm news in this regards. Till last information route will remain the same. But because SL3 is not going to developed in next 2 or 3 years. So this may help Bahria Town meanwhile. For more information please contact Bahria Town also. Will bharia overseas extention,B block stay save and clear from ring road construction? I have no idea about it. Please contact LDA Office at one window. I. SL-1: Starts from Sui Gas Town and ends at Ferozepur Road. The alignment passes through Kamahan village, crosses the Hadiara drain and ends at interchange to be constructed at Gajju Mattah on Ferozepur Road. II. SL-2: Starts from Gajju Mattah Interchange and ends at Raiwind Road. This part of alignment passes near Islampura, Halloki, through Fazaia Housing Society and ends at interchange to be constructed on Raiwind Road. III. SL-3: Starts from Raiwind Road and ends at Multan Road. The alignment passes through Bahria Town, NFC-II and ends at interchange to be constructed on Multan Road. In first stage SL-1 and SL-2 will be developed, SL-3 will be developed at later stage. 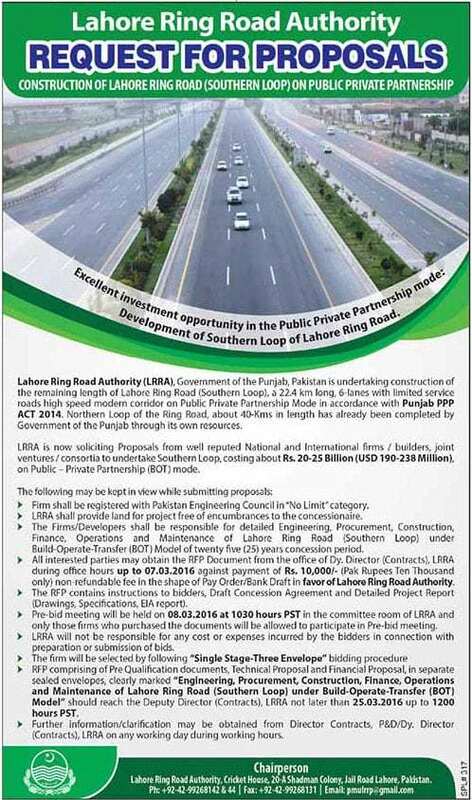 Lahore Ring Road Authority has advertised on 20 Feb, 2016 for Request for Proposals (Construction of Lahore Ring Road Southern Loop on Public Private Partnership). Bidders ask to submit their proposals till 25 March, 2016. Hope fully it is going to be start soon. Brother …Don’t worry about your plot, you invested for your grand Childs. Eden will not give you possession of this plot before 50 years. So it doesn’t matter if any road being passed over your plot. Keep consider that LDA has to remove these all ring roads after each 40 years life cycle ultimately you will have free plot without any infrastructure at that time. DEAR SIR MY PLOT IS SITUATED AT GAJUMATA RIGHT WITH EDEN HOUSING SCHEM. PLEASE TELL ME ON WHICH PLACE RING ROAD HAS BEEN PASSED THERE. Siddique bhai please contact LDA for ring road route map. sir plz tell about DHA bhawalpur… is it safe investment or not?? DHA Bahawalpur is 100% safe and secure investment. please shadbagh underpass ka project ko quick shuru ke dain plzzzzzzzzzzzzzzzzzzzzzzzzzz!!!!!!!!!!!! ring road kab complete ho ga?